The early bird catches the worm. Who cares! Let'em have it. You want to be out on a boat in Punta Cana in the PM. We have the boat and the sunset. You coming? 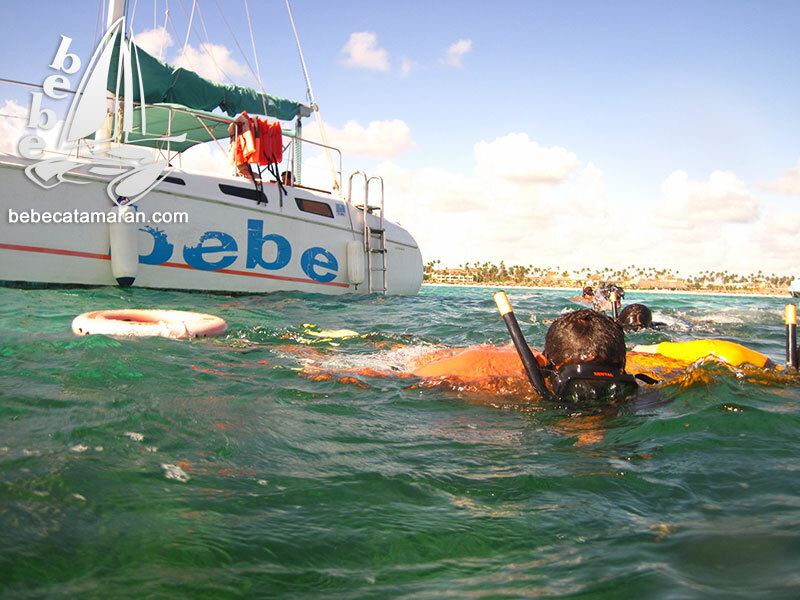 Good afternoon and welcome to Bebe Catamaran, where we own the Afternoon hours on Punta Cana’s waters. Round trip, comfortable transport is included. It’s easy. We pick you up at your hotel lobby and take you directly to the boat at Bibijuagua, an amazing section of Punta Cana beach. Although a nightmare to pronounce, Bibijagua is the center for souvenirs made by local artisans. You can shop but you cannot drop. The highlight of this day is a catamaran excursion! Board the boat and meet the crew. We have a captain, servers and a bartender. At first you may think the captain is the most important crew member but normally the bartender wins the popularity poll. Our first stop is a local coral reef. Tons of tropical fish swimming about. One of our crew members will show you around and throw some bread to attract more fishies. Have you ever been surrounded by colorful tropical fish in the Caribbean? Does that sound ok to you? After our snorkeling stop at the reef, ding ding ding! The bar is open. If you didn’t snorkel, you already started drinking. If you did snorkel, then you’re just getting started and you have to catch up. Rum, beer, soda, and water. Psssss...it’s an open bar so you can drink all you want. Don’t be shy! To curb any munchies we have chips, salsa and fresh fruit on board as well. A smooth ride south bring us to Punta Cana’s infamous natural pool. People, this is a sand bar, far from the shore with waist deep waters. So, to reiterate, you get to stand in the middle of the Caribbean Sea. Then, to make matters better we serve you food and alcohol on the floating bar. Who does this? Bebe Catamaran does and we’re inviting you. It’s Punta Cana in the PM at it’s best. Depending on the time of the year, watch a ridiculously beautiful Punta Cana sunset with reds and oranges that stretch as far as the horizon reaches. This can be taken in as we slowly cruise back to Bibijuagua, drink in one hand and selfie stick in the other. 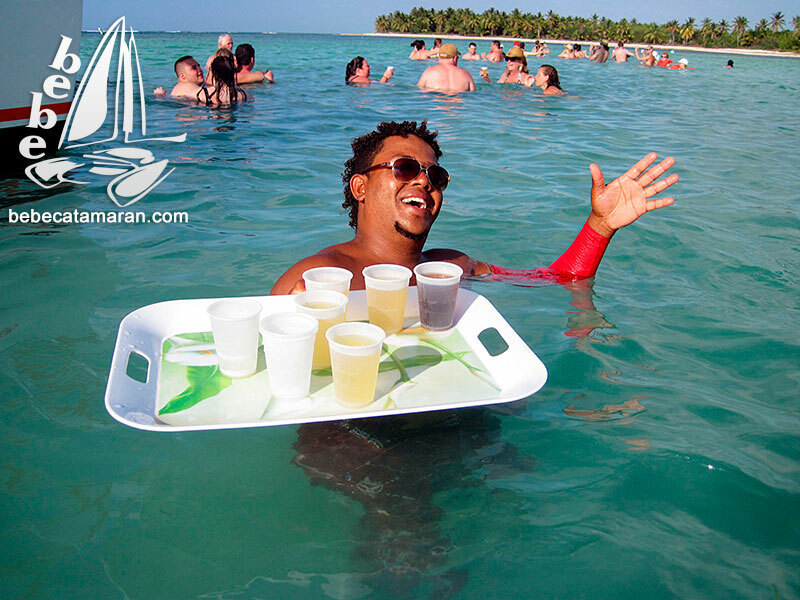 There is no better cocktail hour than on Bebe Catamaran in Punta Cana.